The Institutional Subscription Manager (ISM) features of Eli Review are designed to enable representatives from institutions that have made large purchases of Eli subscriptions to control how those purchased seats get allocated, monitor how they are being utilized, and recall and reallocate those subscriptions, if necessary. 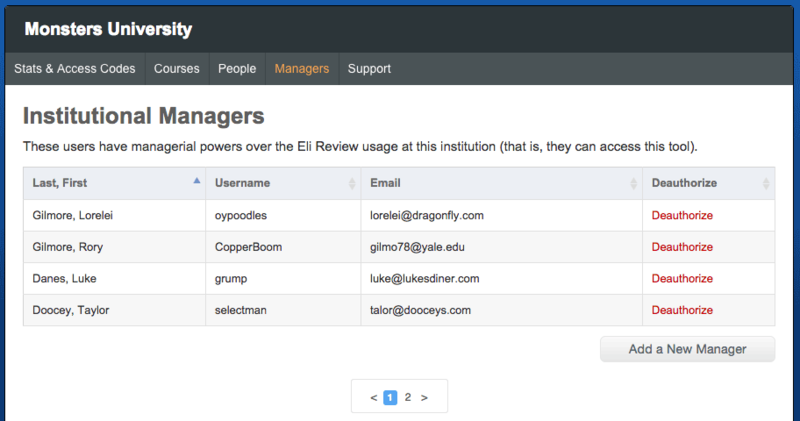 The Institutional Subscription Manager features of Eli Review are designed to enable representatives from institutions that have purchased Eli subscriptions in bulk to control how those purchased seats get allocated, monitor how they are being used, and recall and reallocate those subscriptions, if necessary. Special User Role: when an institution purchases Eli seats in bulk, that institution identifies one or more individuals who will serve in the role of “institutional subscription manager.” These individuals will need to have regular Eli user accounts, but those accounts will have a special “Subscription Manager” role within Eli that will enable them to access these features. How Subscriptions Work: Any Eli user can create a course at no cost, but participation in that course as a student (writing, review, and revision) requires an Eli subscription. Students in courses affiliated with an institution that has made bulk purchases may use one of these seats (see “How Course Affiliation Works”) but students in courses not affiliated with an institution may purchase a subscription individually using PayPal. How Course Affiliation Works: When an instructor creates an Eli course, they are prompted to specify the institution at which that course is taught. Instructors can choose any institution – there are no security measures to ensure where a course is actually taught. However, only courses that use an “access code” created by an Institutional Subscription Manager will be able to use seats purchased by that institution (see “How Seats Get Allocated”). How Seats Get Allocated: An institutional manager can create special “access codes” to share with instructors. Instructors can use these codes to associate course(s) with the institution. Any student who enrolls in an associated course will be assigned a seat purchased by the institution (assuming they don’t already have one). How Seats are Managed: Seats can be managed both at the level of individual students or entire courses. For example, if a student drops a course, or if an instructor blocks a student from course access, the seat used by that student will return to the institution’s pool of available seats (assuming that student isn’t enrolled in more than one course at the institution). The institutional subscription manager can recall seats allocated to an individual student and can also recall all of the seats used in an entire course. Once a user has been assigned that role by an Eli administrator, the next time they log in to Eli they will see a primary navigation option that other users will not see, labeled “Subscription Manager” on the home screen. If the user manages subscriptions for only one institution, they will go directly to the manager features for that specific institution. In the unlikely event that a user manages subscriptions for more than one institution, they’ll be prompted to select the institution they wish to manage, at which point they’ll be taken to the manager features for that institution. From here, the user will be taken to the dashboard for the selected institution, where they’ll be able to carry out a series of tasks. The primary role of the Subscription Manager is to create and distribute access codes which instructors can use to give students access to the institution’s pool of purchased Eli Review subscriptions. To do this, find the panel labels “Stats & Access Codes” in the Subscription Manager feature. The Access Code panel will give a heads-up display of all existing access codes, both active and inactive. The code tables will reveal the code, how many courses have utilized that code, how many students are in those courses, and when the code expires. Once the code expires, instructors will no longer be able to use it to affiliate their courses. Code Name: a descriptive name for the code. Instructors and Students will never see this name; it is only for managers for organizational purposes. Expiration Date: select the date on which the code will no longer work. The code will no longer grant users access to subscriptions as of 11:59:59 PM on the selected date in the institution’s time zone. Once the code expires, you can find it and its usage data under the “Inactive Codes” tab. Note: the maximum expiration date for a group is the end date of the institution’s subscription with Eli Review. Access Code: Eli Review will automatically generate an access code for you. This is the code to share with instructors, which they will use when creating their courses (or with existing courses). You can change it later if necessary. Strategies for creating codes: Codes can be created and distributed in any number of ways. A manager in a high school might, for example, create groups for English, Social Studies, French, and so on, allocating each subject area a certain number of seats. Each group would have its own access code that the manager would share with instructors, and when the instructor uses that code while creating courses, those courses will align with the correct subscription group. Another option is to create a new access code for every course at the institution. The process is arbitrary and can be modified as necessary. Walk through the on-screen instructions for creating a new course (again, if you haven’t done so already). While creating your course, when asked “Does your institution have an Eli site license?” say “Yes” and use the “Institution Code” included below. If you’ve already created your course, just go to “Account Settings” in that course and select the “Enter Institution Code” option, using the code included below. And that’s it! Once you’ve successfully used the Institution Code, your students will be able to use Eli at no cost to them. If you need more help, see the Eli user guide at https://elireview.com/support/guide/instructors/courses or email me directly. Happy reviewing! Affiliated courses – a list of all courses that have used this access code to gain access to the institution’s seats. New/Disable/Delete Code – the manager can generate a new code or disable the access code. This option may be necessary if the code is being shared inappropriately or if the manager wants to prevent any additional course affiliations. Adjust Expiration Date – if the manager decides that the code must be active longer, clicking the “Adjust Date” link will make it possible to select a new expiration date. Usage Data – the manager can see, at a glance, how many students have enrolled in courses affiliated with the code and how much activity has been assigned in those courses. Download usage data – the Active and Inactive courses tables all have a “Download this full table as .csv” option, which will provide the table data in a downloadable comma-separated values file. Managers can use this, then, to create reports of group activity. Clicking the name of any course in this report will display the details for that course, as will clicking the name of any instructor. 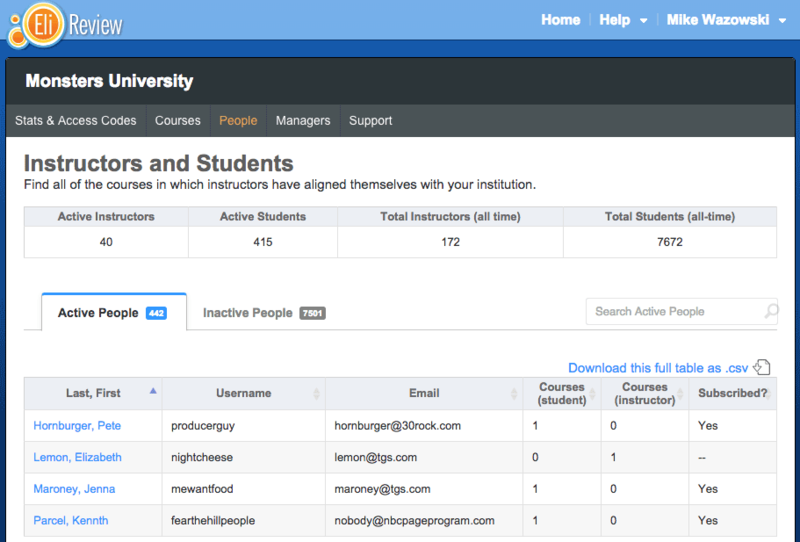 In addition to observing activity by looking at access codes, the subscription manager feature makes it possible to look in detail at activity across all courses at your institution or at individual users and their activities as both instructors and students. 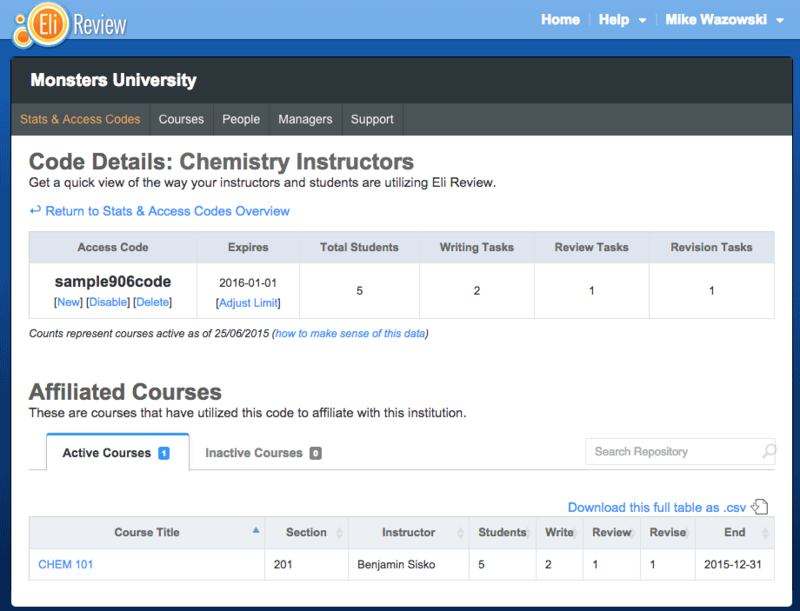 The table containing course information can be searched using the “Search Active Courses” box that will search course titles, sections, and instructors by keyword. Columns in the table can be sorted, making it easy to alphabetize the course list, sort by date ending, by enrollment, or activity count. Finally, the entire course table can be downloaded as a CSV file that can be used in Microsoft Excel or database application. 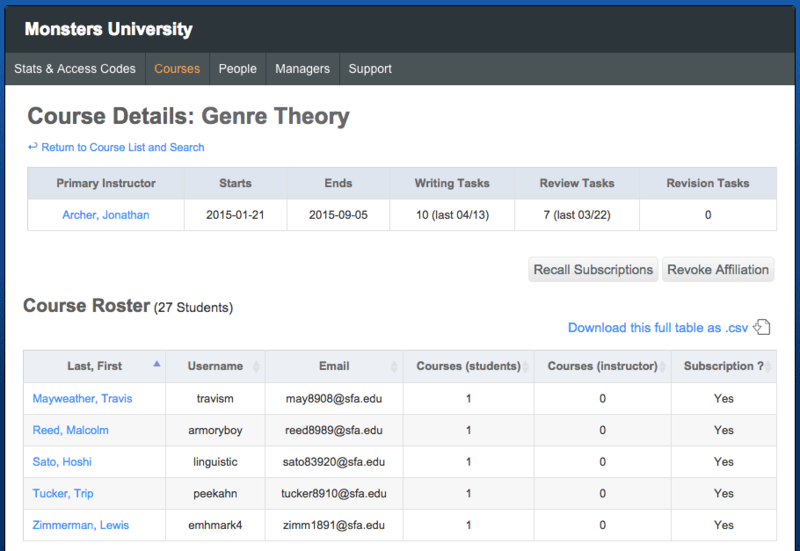 Clicking the name of a course will open the corresponding course detail view. Recall Subscriptions: this option will recall all seats used by students in this course and return them to the pool of available seats. Those students whose subscriptions are recalled will no longer be able to participate in Eli courses (unless they purchase a subscription independently). Revoke Affiliation: this option will both recall all seats used by students in this course but will also remove this course’s affiliation with the institution. This option might be needed when courses that are clearly not affiliated with the institution have aligned themselves, or in the unlikely event that an instructor was abusing subscriptions. Clicking the name of any person in this report (instructor or student) will open their corresponding user report. If managers are interested in learning more about the activities of individual instructors or students, clicking the “People” tab in the primary navigation will open the People dashboard. From this view it becomes easy to find information about people very quickly. The search feature makes it easy to find people by name, Eli Review username, or email address. 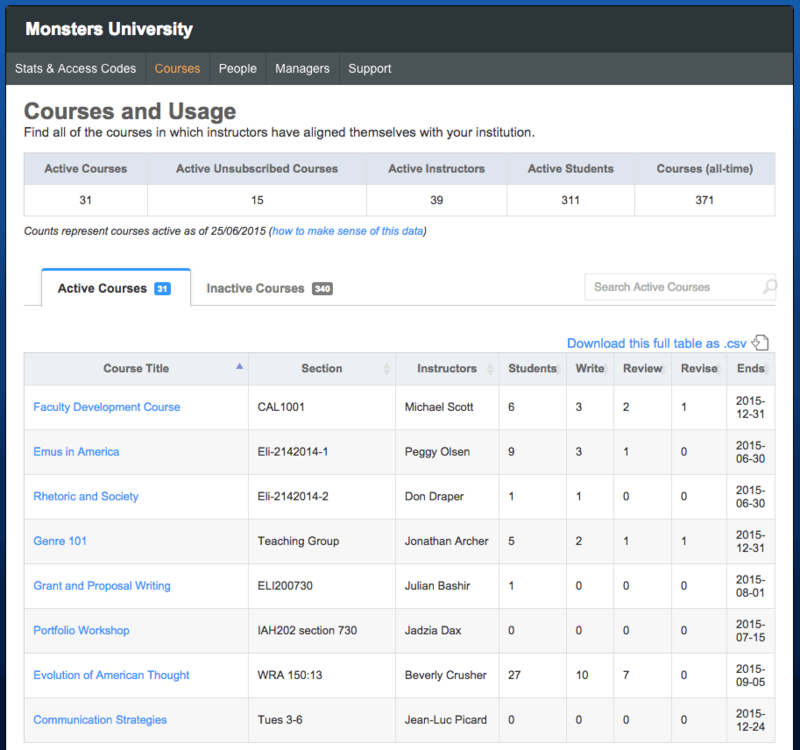 Column sorting makes finding particularly active users easy, too; sort the “Courses” columns to find the users who’ve enrolled in the most courses either as an instructor or as a student. Clicking the name of any individual user will bring up a report about their participation in Eli Review. 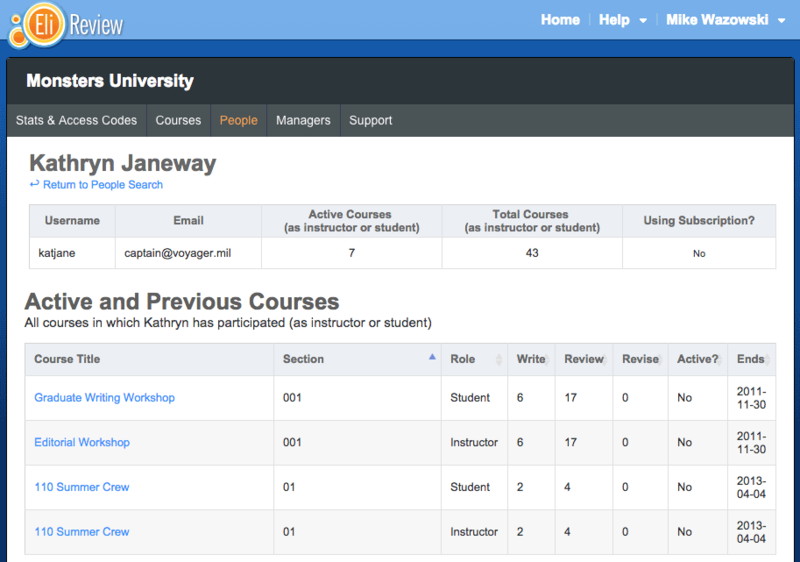 The user detail view will reveal all of the courses in which that person has been a participant, either as an instructor or as a student. It will also reveal the amount of activity assigned in that course, although these numbers do not necessarily reveal whether or not the person completed the work they were assigned. Institutions have the ability to control who does and does not have permission to user the subscription manager features. To manage the managers, just click the “Managers” tab. This report will list everyone who has been assigned the “subscription manager” role. From here, existing managers can easily be deauthorized, or new managers can be added by clicking the “Add a New Manager” button. Access codes: all courses created through the LMS are automatically added to a special access code displayed in the “Access Codes” table. This means no addition work is required to align a course to your institution – it is done automatically. User account normalizing: when instructors create their courses, and when students enroll in those courses, the LMS connects their Eli accounts to your student information systems, which makes resolving the data that comes out of Eli extremely easy to resolve against an institutional data set (for record-keeping or research purposes). If you’re interested in learning more, read about Eli Review and Learning Management Systems.